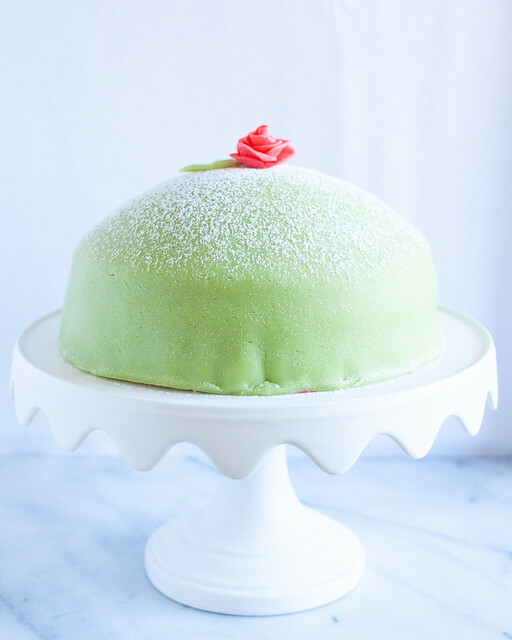 I'd been looking for a cake to celebrate spring and Easter and the first thing that popped in to my head was a Swedish Princess Cake (or Prinsesstårta). It's been on my baking bucket list for what seems like an eternity so it was finally time to have a go. Fittingly, I think my introduction to these beautiful cakes was at IKEA many, many years ago...ha! 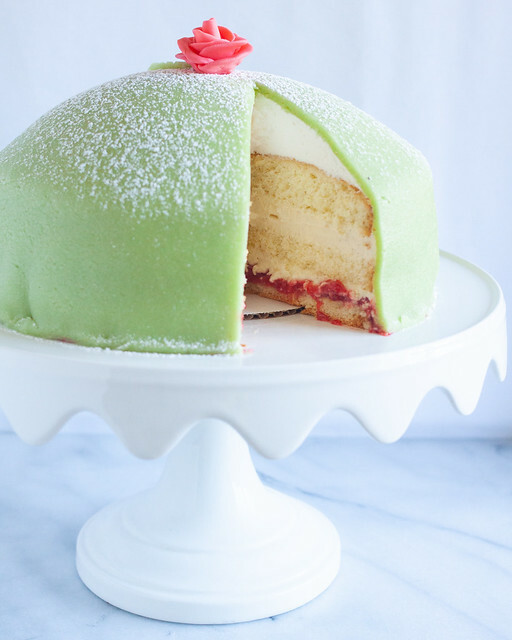 What could be more delicious than moist vanilla genoise sponge cake filled with layers of raspberry jam, diplomat cream a gorgeous dome of whipped cream and then covered in verdant colored marzipan? Nothing, I tell you! For the recipe I turned to Mary Berry, of The Great British Bake Off fame. 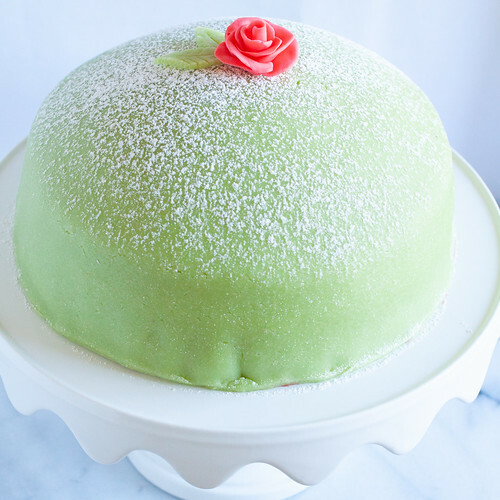 Princess cake was the technical challenge in the Continental Cakes episode of Series 5. At first glance this recipe is daunting, there's a lot of ingredients and a lot of steps!, but don't be deterred. While the contestants were given just over two hours to complete their cakes I made my life easy and decided to make it over the course of a weekend. Some of the components (pastry cream, jam, marzipan and fondant rose) were made on the first day and the sponge cake and assembly were done on the second day. I passed on the chocolate decorations from Mary's original recipe and kept it sweet and simple with a light dusting of powdered sugar. I just think it looks so stunning in an elegant and understated way. I don't know about you, but I seriously love all the spring feels this cake is giving me. The beautiful pastel green marzipan exterior and cream and pink interiors are just so refreshing and light. No doubt this beauty will banish any wintertime blues you may have. For the vanilla custard, pour the milk into a pan with the vanilla paste and place over a low heat until just simmering. Remove from the heat. In a large bowl, whisk the egg yolks, sugar and cornstarch together until pale and creamy. Remove from the heat and beat in the butter until melted and incorporated. Transfer to a bowl, cover the surface with clingfilm to prevent a skin forming and leave to cool. Set aside to chill in the fridge. For the jam, put the raspberries into a deep saucepan with the sugar and two tablespoons of water. Cook gently over a low heat, stirring occasionally, until the sugar is dissolved. Bring the mixture to the boil and boil vigorously for about four minutes, or until the temperature reaches 104C/219F on a sugar thermometer. Transfer to a heatproof bowl and leave to cool completely. For the sponge, preheat the oven to 180C/350F. Grease and line the base of a 23cm/9in springform tin with baking parchment. Put the eggs and sugar into a large bowl and using an electric mixer, whisk together until the mixture is very pale and thick and the whisk leaves a trail on the surface when lifted. This will take about five minutes. Sift the cornstarch, flour and baking powder over the egg mixture and carefully fold in using a large metal spoon. Fold in the melted butter, taking care not to over mix. Pour the mixture into the lined tin and bake for 25-30 minutes until the sponge is golden-brown and has just started to shrink away from the sides of the tin. Remove from the oven and set aside to cool. When cool enough to handle, turn out on to a wire rack to cool completely. For the fondant rose, roll 10 little pieces of fondant into small balls about the size of a cherry stone. Dust two small pieces of parchment paper with icing sugar and one by one, place the balls of fondant between the sheets of parchment and flatten each ball out with your fingers, to a thin circle, approximately 2cm/1in in diameter. These form the petals. Roll the first petal up like a sausage to form a bud and wrap the remaining petals around the bud to make a rose. Bend and curl the edges of the petals, to make them look more realistic. Leave to dry for at least an hour. To assemble the cake, using a serrated knife, cut the cake horizontally into three even layers. Place one of the sponges onto a serving plate. Spread a very thin layer of custard over the base of the first sponge. Spoon a quarter of the custard into a piping bag fitted with a small plain nozzle and pipe a border around the edge of the sponge – this is to contain the jam. Spoon the jam over the sponge, and spread evenly within the border. For the whipped cream,bloom the gelatin in the cold water in a small bowl. Let stand for about 5 minutes. Add the boiled water to the gelatin mixture and stir to dissolve. Set aside. Using a cold bowl and whisk attachment, whip the heavy cream and gradually add the sugar on low-medium speed. Whip to medium peaks and then add the melted gelatin mixture all at once. Continue to whip for a few seconds longer until stiff peaks. Fold half of the whipped cream into the remaining custard. Spread one-third of the custard cream over the jam. Place the second sponge on top and spread over the remaining custard cream. Place the third sponge on top. Spoon over the remaining whipped cream covering the sides and smoothing into a small dome shape on the top. Set aside in the fridge for an hour. For the marzipan, mix the ground almonds and sugars in a mixer fitted with a dough hook, before adding the eggs and almond extract. Knead in the bowl until it forms a stiff dough. Turn out onto a surface dusted with icing sugar. Using a cocktail stick add a tiny amount of green food color and knead to an even pastel green color. Roll out the marzipan on a surface lightly dusted with icing sugar, to a 40cm/16in diameter circle, large enough to cover the cake. Lift the marzipan up over the cake and using your hands, shape the marzipan around the sides of the cake to get a smooth finish. Trim any excess. Dust the top of the cake with a light sprinkling of powdered sugar. Top with the fondant rose.